WARNING, Satellite Trader is a SCAM! This Satellite Trader review proves that it is a scam made to lose your money. It is presented by Richard Heffner. Heffner claims that his binary options trading software has a 100% win ratio because it uses quick GPS technology. Thanks to this his Satellite Trader can allegedly make you $850 per hour or $20,000 per day. And all this for free, because Satellite Trader is free. The reality is that Satellite Trader is a recycled scam. It first appeared under the name of GPS Trader and it has lost money to a lot of people. 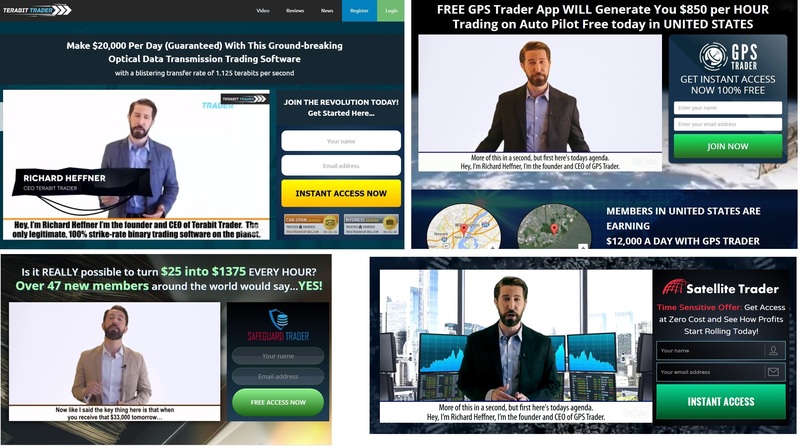 You can even notice in the Satellite Trader video that Heffner is speaking about GPS Trader, because scammers used the original video, they just changed the background. But it is not all, as you can see on the image on the right, this same scam also appeared under other names like Safeguard Trader or Terabit Trader. This actor is a professional scam artist, sometimes he uses different names, like David Hefner. His presence alone is a guarantee that Satellite Trader is a scam. We have also checked the Satellite Trader software to see what scammers did use this time. It is an app developed and offered by scammers only. 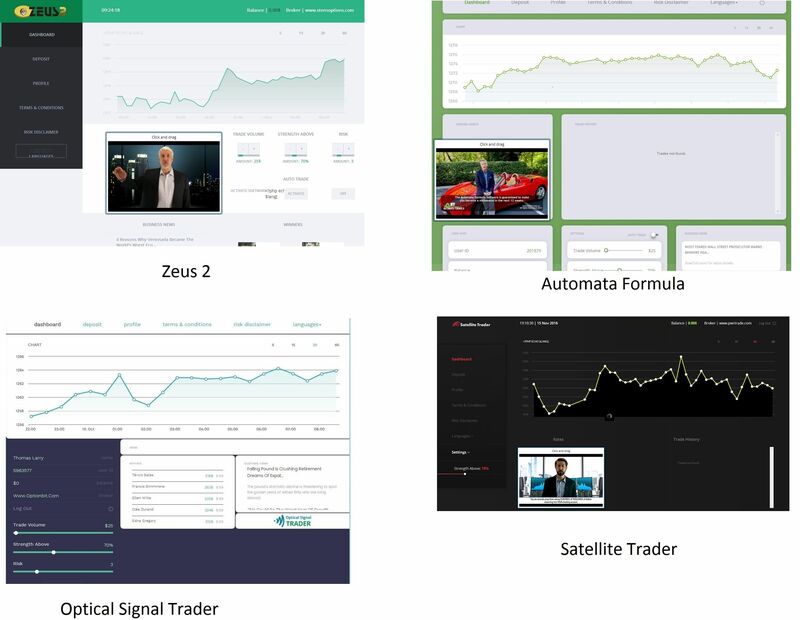 Look at the image, you will see a few examples of other binary options scams that use this same exact app, like Zeus 2, Automata Formula or Optical Signal Trader. This software is losing money in trading with real money, we have a lot of feedback about it from real users! Now let us explain how Satellite Trader really works. Its only purpose is to make you open an account and deposit money with an unregulated broker that these scammers are affiliated with. They get paid for referring new depositing clients to this broker. This is why they won’t let you try their software until you deposit. It is losing money and they need you to discover it only after they get paid their commission. 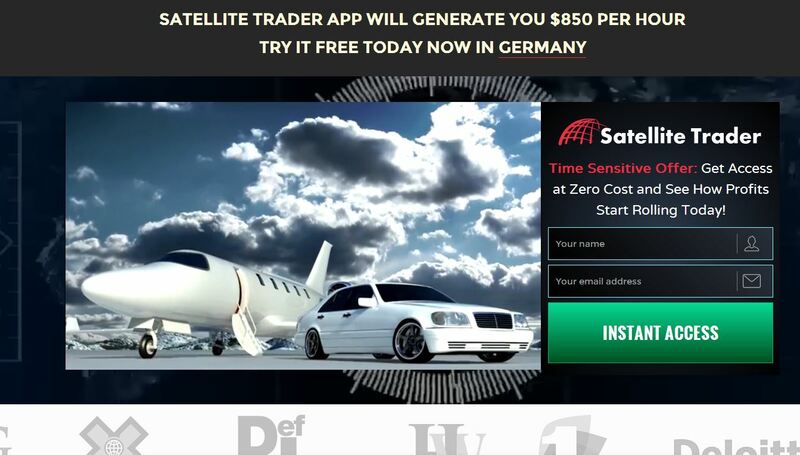 Satellite Trader is a recycled scam that will give you a worthless software that will lose the deposit you will be force to make. So stay away from it, if you don’t want to lose your money! You can try a free demo account with a regulated broker to see what it takes to really make money with binary options. You have to test and learn on the demo until you become profitable. Only then you can start trading with real money.